The difference between the 52xx and 62xx models is that users of the latter models can rely on an online service for access anywhere in memory, such as for transferring vacation photos to their homes. In the NAS 6210 and 6220, that are different only in their number of hard drives, and the removable drive modules are also lockable. Both have one USB port in the front and two in the back, along with an Ethernet port. The NAS 5220, at about $217, is going through its final quality checks before being shipped, although the RaidSonic spokesperson revealed no fixed release date to Linux Magazine Online. The model, according to RaidSonic, is mainly for savvy users, while the 62xx twins are more "plug-and-play." The 5220 access is only via FTP in a bit more complicated way. The hard drives are not removable, but are easily accessible from underneath. 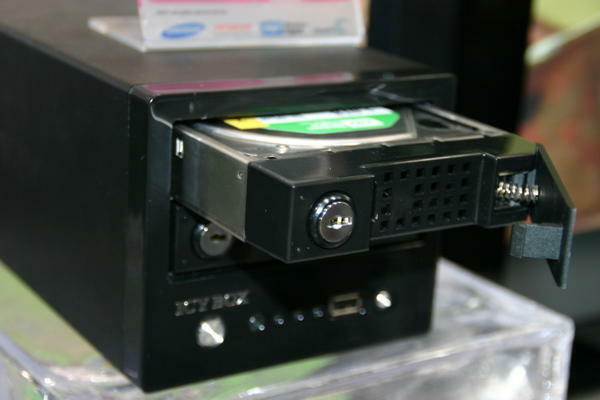 The NAS 6210, which without a hard drive should cost around US$230, also provides what should be an already workable eSATA port. The 6220, which should appear end of April at an undisclosed price, works over hardware RAID for its two 3.5" drive modules. A change from its previous model is the Marvell chipset. In contrast, some compromises were made to the board design and operating system for the 5220. All devices run Linux (an extended Reddoxx in some version). Inquiry into source code availability proved unsuccessful.